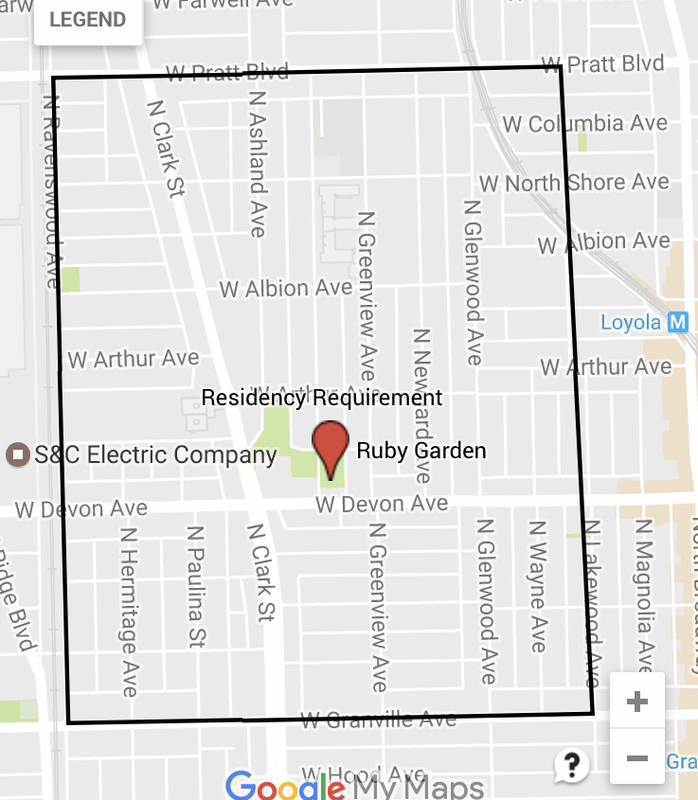 Ruby Garden is a community garden located within Chicago Park District's Schreiber Park. Individual plot holders must reside within our boundaries, shown below. Having close residents care for the space insures that the garden maintains a community vibe. 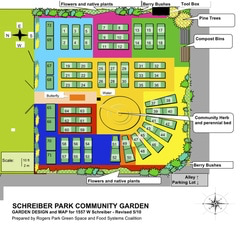 Half of our plots are granted to non-profit organizations working within the community. These organizations use their plots to provide gardening opportunities and food for the people they serve. If you are interested in joining the garden as an organization, or getting involved with one of the organizations currently gardening, please contact us. Boundaries are defined by Pratt on the north, Lakewood on the east, Granville on the south, and Ravenswood on the west. THE 2018 APPLICATION IS NOT VALID FOR 2019 AND HAS BEEN REMOVED. ​The 2019 gardening season is just around the corner. If you are interested in obtaining a plot, please contact us. Plot assignments are decided by lottery, in March 2019. Plot applications are due on March 6th. (We will collect applications all summer long, until our wait list is full!) We collect applications electronically. Please fill out the form at the google link below. We are using an electronic form this year - no more pdfs or having to email them separately. If you have questions or technical difficulties, just contact us. We're here to help. Although there is a fee for gardening at Ruby Garden, we do have scholarships available. Information can be found on the application below. Happy gardening! The 2019 application has been deactivated as the deadline has passed to apply for a plot. We will reactivate the link once all plots are assigned and we re-open the wait list.